Over the first week of mid-December training, Mikey Garcia ached physically from every muscle and body part perhaps like never before from a grueling routine he hadn’t before experienced. “My body was in pain last week during my first week here, my legs, my stomach, my shoulders, everything was hurting,” said Garcia , 31, during an interview with BoxingScene.com on December 28. Four-division champion Garcia (39-0, 30 KOs) is leaving no stone un-turned entering his March 16 clash of unbeaten and 147-pound debut against IBF welterweight champion Errol Spence Jr. at The Dallas Cowboys’ Stadium in Arlington, Texas, on Fox Pay Per View. Garcia yields height (5-foot-9 ½-to-5-foot-6) and reach (72-inches-to-68) and is at a perceived disadvantage in speed and power against the “The Truth” Spence (24-0, 21 KOs), a 28-year-old who is making his third defense in pursuit of his 12th straight knockout victory against a man trying to win a fifth crown in as many divisions. To that end, Garcia’s working with strength and conditioning guru Victor Conte at his Scientific Nutrition for Advanced Conditioning (SNAC) facilities in San Carlos, California, an organization that supplies legal sports nutrition products and supplements. As part of Conte’s program, Garcia’s December 28 workout included running hills, sprints and bungee cord work– all on the beach — as well as various forms of plyometrics and mitt and core exercises in low and high altitude simulation domes. “After today, I was a little sore and a little tired from the regular work, but nothing unusual or that can keep me from continuing in the gym,” said Garcia, who will face Spence near the latter’s hometown of DeSoto, Texas. After leaving SNAC, where he is being overseen by 86-year-old Conte associate Remi Korchemny, Garcia will begin traditional sparring and gym work next month with his brother and trainer, Robert Garcia, their father, Eduardo, and Robert Garcia Jr., in Riverside, California. Garcia’s chief sparring partners are both southpaws in Brazilian Olympic silver medalist Esquiva Falcao (22-0, 15 KOs) and Alex Rocha (12-0, 8 KOs). Falcao is a 5-foot-10 middleweight with a 73-inch reach, and Rocha, 5-foot-10 welterweight with a 70-inch reach. “I’m building up my strength, speed and endurance here at SNAC, and then when I head back to Riverside, I’ll do my sparring and my entire traditional training. We got here on December 18, and we’ll be heading back on January 19. 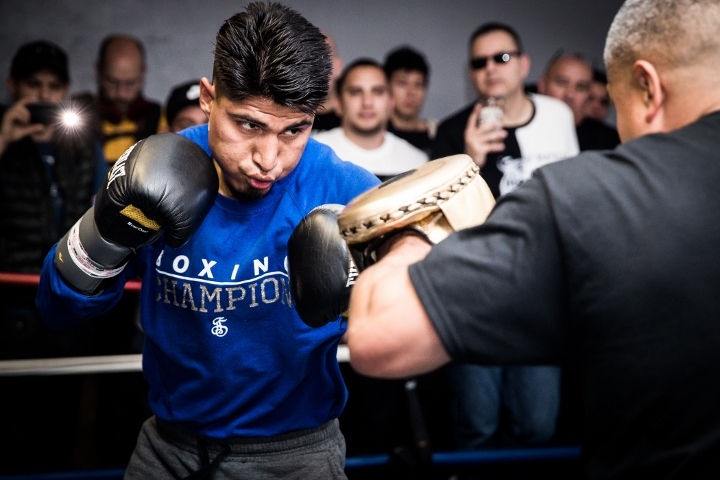 So it’s going to be a full month of work here, and then Victor also gives me guidelines on routines that will allow me to incorporate and continue once I go back home,” said Mikey Garcia.